Son of the late Mr. John Bedford, of More Hall, near Sheffield. He was born at Sheffield, and educated in Paris and at Windermere College. He is a director in John Bedford and Sons, Ltd., and for nine years was an officer in the 4th West Yorkshire Artillery Volunteers, resigning as second Captain of the Brigade. He has been Vice-Consul for Portugal since 1891. 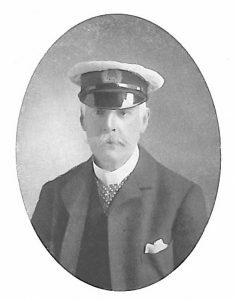 Mr. Bedford was the first Commodore of the Scarborough Sailing Club, being elected unanimously. He is a very keen yachtsman, and owns the little steam yacht Cruban, 26 tons, built by Reid and Co. of Glasgow, engines by Ross and Duncan. She is a first-class sea-boat, and has a fair turn of speed, and has made several prolonged cruises abroad and to the West Coast of Scotland. He also owns the cruising steam-launch White Heather. She is a good sea-boat, built of teak, and with excellent cabin accommodation. Mr. Bedford is an antiquarian and an F.S.A. of Scotland. He is also a keen salmon and trout angler. Clubs: Scarborough Sailing, Humber Yawl, Royal Yorkshire. Residence: 5, Belvoir Ter­race, Scarborough.